In this fast-paced society where everyone seems to be on the run, 10 minutes can be crucial. They can mean some spare time to relax, take a breather, listen to music, nap, call people or catch up with friends. Some even get haircuts from Kaizen. KAIZEN, a novel concept that originated in Japan and has since grown to other countries particularly in Indonesia, has five pillars that make it unique – it’s QUICK, CLEAN, STYLISH, AFFORDABLE and WATERLESS. Its first branch in the Philippines is located at the 5th floor of SM Manila. The word Kaizen traces its roots to Japanese words “Kai” (which means “changes”) and “Zen” (meaning “continuous”). When put together, Kaizen translates to “continuous improvement”, which is exactly the way it is—unique, out of the box, revolutionary. 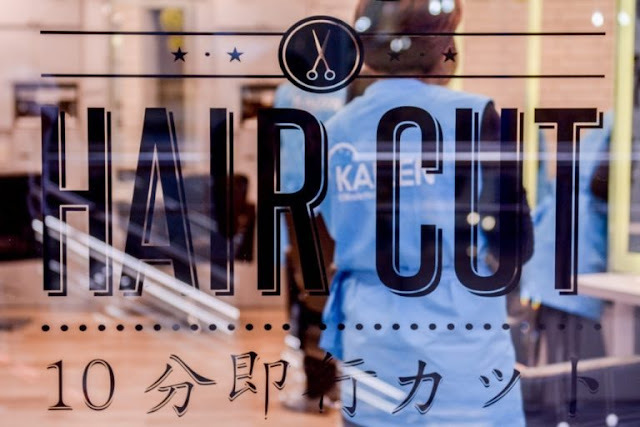 “Kaizen is all about having a speedy haircut with up-to-date styles. 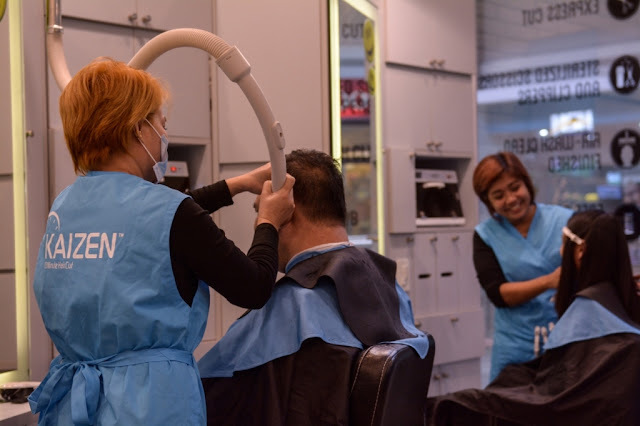 We sterilize our equipment in UV boxes, and we are the most hygienic because we use disposable neck paper in lieu of towels, and the customers take home the comb used for their haircut,” Gabas explained. Using a “zen wash technique”, Kaizen haircuts don’t need water but instead make use of an air-washer vacuum that ensures no stray hairs and a fresh-feeling finish. “Best of all, a haircut costs only 150 pesos, so it’s very affordable,” she added. Visit Kaizen and the first thing you’ll notice is a slogan painted on its glass doors saying: “In here we smile, everybody smiles” and you will immediately feel at home. The contemporary black and white interiors (divided into modern haircutting semi-cubicles) and sleek barber chairs beckon. As you step inside, professional and skilled stylists will greet you with a smile. Most of them trained in Jakarta for the latest hair styles, trends and techniques. The core team, then, trained the rest of Kaizen team in the Philippines. The stylists will give customers a “menu” of haircut styles, start prepping and give their desired cut in 10 minutes. Also called the ‘salon of the future,’ Kaizen caters to customers of all ages, gender, income groups, and lifestyles. Its customers include elderly couples, families, kids, toddlers, teenagers, students, young professionals and millennials (who love to videotape how Kaizen cleans their head, neck, and nape with an air-washer; then post this experience on their social media accounts). “The hair is our crowning glory and having a bad hair day somehow affects our mood. Kaizen is here, offering a snappy solution that will resolve your hair concerns with a reasonably priced haircut without taking too much of your precious time,” Gabas concluded.First established in 2004 at Plaza Setiabudi One, South Jakarta, Kaizen has expanded across Indonesia with 75 branches & growing in Jakarta, Tangerang, Bekasi, Cirebon, Cibubur, Karawang, Bandung, Bali, Batam, and Surabaya. In the Philippines, Kaizen is poised to expand and open more branches in other malls, airports, corporate centers, condominiums and other prime stand-alone locations. It is brought to the Philippines by Techno Holdings Corporation, a well-respected group of companies involved in the distribution of some of the world’s best-known commercial kitchen and laundry equipment; irrigation systems, precision mowing equipment, golf carts and other utility vehicles; gym and fitness equipment and premium lighting systems. The company has also recently opened businesses involved in health and wellness such as Karada Japanese Body Therapy Center and Oracle Korean Beauty and Aesthetic Clinic. To effective treat hair loss, one should learn how to identify the best hair loss shampoo for their own condition. This article will talk about 2 of the best Dht shampoo in the market and their main ingredients used.